The summer months on the college football circuit are no time for vacation. Football coaches covet verbal commitments the way most people enjoy beach days. Coach Dino Babers and his staff are off to a fast start recruiting the Class of 2018. 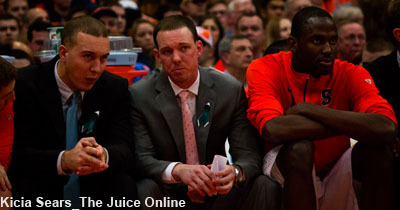 As Babers enters his second season implementing fast-break football in the Carrier Dome, the task becomes easier when the cupboard is full of his guys. 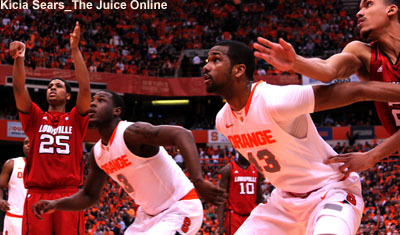 The Orange has nine verbals to date; seven on offense and two on defense. The biggest recruit, figuratively and literally, is 4-star OL Tyrone Sampson. The Detroit product stands at 6-foot-3 and tips the scales at 304 pounds. Louisville, Kentucky, Minnesota, and Virginia all offered Sampson. 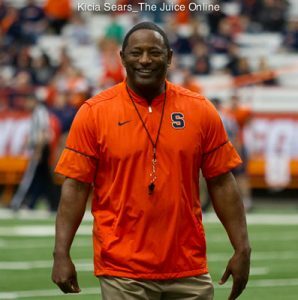 » Related: Which Syracuse football players are primed to produce? Three of the commits all have New York roots. Gabe Horan is a local product from Baldwinsville who plays Tight End while ATH Trill Williams resides in White Plains. Williams was previously a Rutgers pledge. Running back Jawhar Jordan lived in New York before moving to Chandler, AZ. All three players are 3-stars. And three commits hail from the Sunshine state. Running back Akeem Dixon is the type of power back Babers prefers. Listed at 215 lbs, the Vero Beach product packs a wallop when he hits the hole. On the other side of the ball is OLB Ja’Qurius Smith out of Lakeland. Orlando WR Anthony Queeley just gave the staff a verbal yesterday. Standing at 6-foot-2, he’s the type of outside receiver who should excel in Babers’ system. The three Florida recruits are all 3-stars. The annual quest for bowl eligibility, and all those beneficial extra practices that go with it, depends on several factors. The type of talent a coaching staff can recruit has a lot to say about the results on the field. If this June and July are anything like last year – 11 verbals eventually signed National Letters of Intent – Babers and his staff will be busy collecting commitments. The beach days can wait.